Hello and HAPPY NEW YEAR, नया साल मुबारक all! I hope you all had wonderful times over Christmas with respective friends and family. We have been on our Indian travels again, for a well deserved break earnt by Mr Jules. Despite coming down with severe Delhi Belly on Christmas Eve (I never pinned down the source), we somehow managed to make it to our Christmas holiday destination of choice – Pondicherry – on Christmas Day. We flew from Mumbai to Chennai (two hours) and then hired a car and driver for the three hour onward journey to Pondicherry without ‘incident’. Unfortunately, I was in bed most of Boxing Day and the next day which wasn’t great but I did manage to have a couple of walks and a good half day in Pondicherry. We also managed a daytrip to the new-age town of Auroville (please see my next post) and I was fine for our last night’s stay in Chennai. However, in Chennai (also more on that later) we got caught in the tail end of the east coast's second monsoon and were confined to our hotel during a 24 hour downpour. Not one of our more successful trips! Pondicherry (now known as Puducherry but more affectionately as 'Pondy') is an ex-French Union Territory in the state of Tamil Nadu (on the lower east coast) which was ceded back to India in 1954. The location has further been brought to light in recent weeks following the release of the film Yann Martell’s Life of Pi – the story of which opens at the Zoo in Pondicherry’s Botanical Gardens. By Indian standards, this is a neatly planned town – Pondicherry was built using the French grid system and still retains leafy streets with French place names and colourful colonial French architecture. The town is split into two distinct areas – the ‘French Quarter’ and the ‘Tamil Quarter’. Unfortunately, a stinking rubbish filled canal separates the two – you know when you are about to hit the Indian side of the town. On the peaceful and relaxed French side, the French language is spoken heavily. Many of the residents are French, many of the shop and restaurant workers are fluent in the language and from first impressions, most of the tourists are French. Apart from the Tamil pilgrims walking the long promenade, we were one of a handful of British, American and German visitors staying in the town. One of the biggest draws of Pondicherry is the Sri Aurobindo Ashram – a ‘spiritual community’ which attracts followers from all over the world. From what I could tell, Sri Aurobindo retains a wealth of real estate in the town, both in the French and Tamil Quarters. It is almost as if Sri Aurobindo ‘owns’ Pondicherry. As well as the Ashram and all of Auroville, there are schools, libraries, research facilities and shops owned by the organisation. The Ashram attracts a lot of what seem to be single (presumably divorced) middle aged women to the enclave. Women, who have clearly watched too much Eat, Pray, Love (starring Julia Roberts), come to find themselves, forget their cheating husbands and refresh minds and bodies. I saw so many of these women walking alone on the streets of Pondicherry that I felt a bit sad for them at Christmas time. What made me even sadder were the Ashram/Hippy/Traveller fashions. I have a sincere hatred of balloon pants, Birkenstocks and dreadlocks (I intend to devote a post to this sometime) and in my mind there is no excuse for sporting these offensive items in public. (Note: pyjama shaped clothing should be strictly assigned to the bedroom). I found it disappointing that Pondicherry was full of so many balloon pant wearers. Merde. The shops in Pondicherry - on the French side - are in another class altogether. With prices to match. Due to my illness I was not able to investigate them as thoroughly as I normally would (!) but it only took two or three looks before I realised that the shops were too overpriced (and a bit too arty) to bother. There are a couple of nice boutiques – Via Pondicherry on Romaine Rolland sells unusual sequinned/embroidered bags, ‘ethnic fusion’ pashminas and quirky housewares. 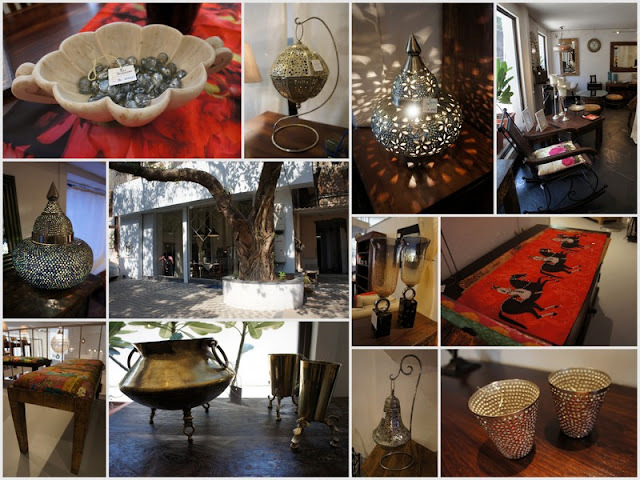 The Neemrama shop at Hotel L’Orient stocks nicely curated items such as camel bone placemats, serving spoons and picture frames. We bought a posh pair of silver egg cups with covers here (completely useless items!) Around the corner is Living Art, with a selection of brassware, upcycled shoulder bags, women’s clothing and shoes (including some nice Mojari style flatties). There are also several large colonial antiques showrooms but I didn’t find anything I couldn’t pick up in Chor Bazaar or Camelot. And I am sure it would all have been very expensive. The Sri Aurobindo Ashram has boutiques of its own but I wasn’t particularly impressed by the range of handcrafted papers, candles and incense sticks. I would rather buy my stationery at Chimanlals in Mumbai. Sri Aurobindo does have a fantastic shopping complex at Auroville though (which I will write about in my next post). By far the best place to buy a true souvenir of Pondicherry is at the embroidery school opposite Hotel L’Orient on Romaine Rolland. 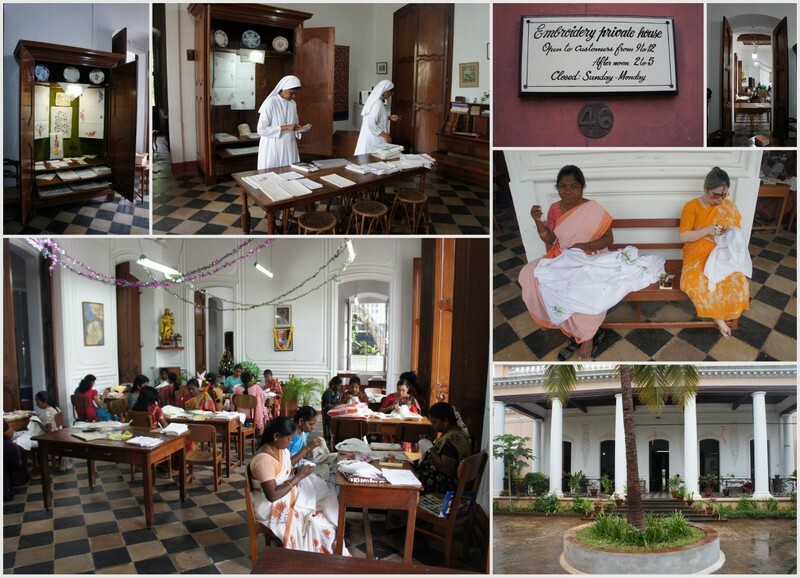 This place, a beautiful French Colonial convent is run by nuns who teach local women how to sew the gorgeous French style linens. We bought some hand embroidered napkins and hand towels in a stiff linen. Although the prices are also a bit stiff at 400 and 700 Rs respectively for these items (£4.50 and £8.00 each), at least you are paying something back to help sustain these women’s livelihoods – and the stuff is beautiful! We stayed at a Neemrana ‘Non Hotel’ – Hotel L’Orient on Romaine Rolland (handy for the invalid shopper!) – a heritage property beautifully restored from an old school building. 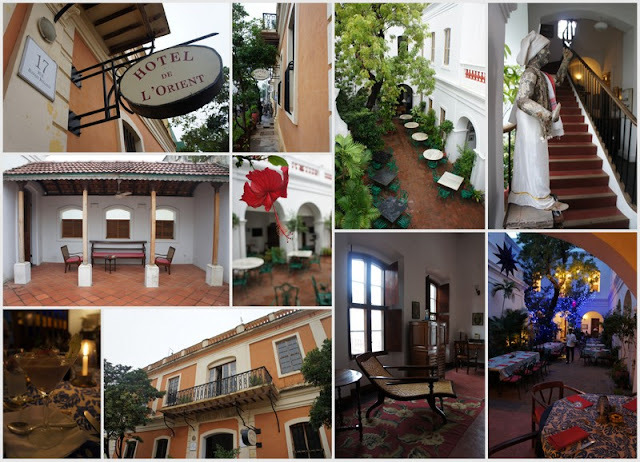 Our room - named Karaikal - was full of fantastic colonial antiques with a huge terrace overlooking the central courtyard. The bed was ridiculous though – so high up that we needed steps to get on to it! The food was pretty good at the hotel – I convalesced with a decent steak and chips – but the service was a bit chaotic (‘Non Hotel’ perhaps means ‘Non Service’?). One of the pilgrims posing for a photo! For anyone thinking of making the trip to Pondy, I would like to recommend this taxi service to and from Chennai Airport. I received many quotes for upwards of 3,500 Rs (one way) for a car and driver from other companies. Pondicherry Taxi Service charges 2,350 (plus airport parking and tolls of about 250 Rs which you pay separately) for a Tata Indigo. The company communicated with me by email and text at all times, the driver was always there and waiting, the cars were clean and they drove safely. The journey only took about three hours including a chai stop. You will find that the roads are in much better condition than in Maharashtra and the traffic not half as manic! 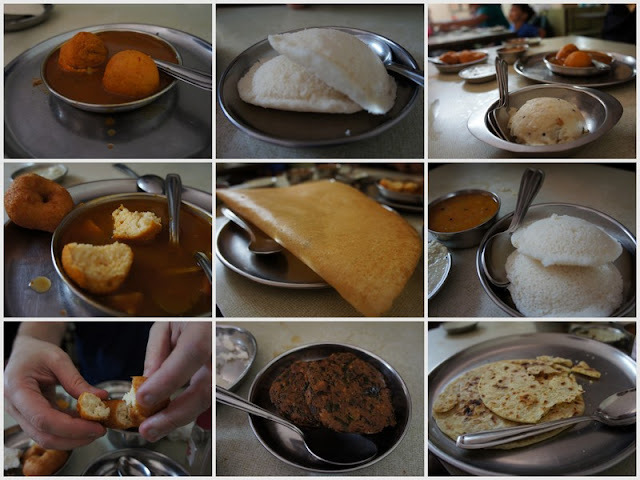 We heaved ourselves out of bed early this Sunday morning to join some friends for a traditional Indian breakfast in Matunga. Matunga - south of Mahim Creek and just south of Dharavi - is (as I discovered this morning) a nice, leafy suburb with a few famous (but still 'local') places to eat. We were aiming for the most fabled of these, Cafe Madras - but by the time we arrived at 9.15 am, the queue was already out of the door and trailing along the pavement. As none of us were into waiting, our trusty experts took us to another place they knew, a few paces away across the road and slightly around the corner. Here, at Anand Bhavan, we only had to stand in line for two minutes for food that would be as equally good as that dished up at Cafe Madras. How to aerate a coffee. No fancy coffee machines here! The cuisine served in these Matungan restaurants is predominantly South Indian. We are told by our friends that it is this South Indian food that is adored by the many local Gujurati residents who make up the bulk of those queuing and eating. Perhaps because it is vegetarian only. Inside Anand Bhavan. Clean, organised and serving delicious South Indian food. After getting seated upstairs in Anand Bhavan (by a rather hunky guy that us ladies took a bit of a shine to - good enough reason alone to visit! ), our friends thankfully did all the ordering. Mr Jules and I certainly do not know what we are doing when it comes to ordering regional Indian foods (yet - let's try to rectify that). It was only a short wait before we were presented with a delicious array of traditional breakfast items - rasam wada, utma, idlis, dosa, wada, sambals and coconut chutneys - and the best coffee ever. The rasam and sambal is spicy and watery and loaded with flavour. And from what I have read from reviews of these restaurants, it is the flavourings of these watery accompaniments that sets these eating establishments apart from each other. As well as how fluffy the rice idlis and how paper-thin the dosas are. Friends back home might think it's quite weird eating such spicy food for breakfast - my only experience of this previously being when I was hungover in my twenties and eating leftovers from a Friday night curry the next morning. However, the staples of idlis, potato dosas and fried wadas really don't work without the savoury accompaniments. 1. Rasam Wada. 2. Idlis (made out of rice flour) 3. Utma 4. Rasam Wada broken open and a potato wada on the side 5 A perfectly formed Sada Dosa 6. Rice Idlis with Sambal 7. Mr Jules the hand model demonstrates the inside of Wada - perfectly fluffy and non greasy on the outside 8. Spinach something - didn't get the name but yummy and slightly crunchy. 9. The only sweet item we had - a delicious paratha type thing stuffed with coconut. We were kindly treated to breakfast by our friends but I think that the bill for four adults and three small children only came to a couple of hundred rupees. After we left the restaurant, Mr Jules and I went for a walk around Matunga market where we bought a nice big bag of veg for our Sunday roast - which was noticeably cheaper than Bandra's Pali Market and without the need to haggle. What a lovely and inexpensive Sunday morning! Controversial reading matter found at one of the second hand book stalls outside Anand Bhavan! Matunga Market - where we bought veg for tonight's Sunday Roast. Photo Essay : Groups No 2. This is the second in my series of photos of Indian Groups (original post here). The first is my favourite - Indian Santas and Elves that I snapped in a shopping mall today...very topical! The rest of the pictures are from my recent travels. Thanks for looking! There were two of us taking photos and they didn't know which camera to look at! Taken at Amber Fort - can you believe that these policemen let me take their photo?! These ladies in their colourful saris were dancers at a spice plantation we visited in Goa - every time someone entered the plantation (more of a theme park really), a bell would be rung and they would get up to do their little welcoming song and dance. Poor things, stuck forever in Ground Hog Day. Two home furnishing store reviews in a row...what is going on? Mumbai is on the up, that's what is going on. Finally, we are getting new and exciting choices when it comes to making our homes look nice. And a very clever young lady (and ex-lawyer to boot) - Maulika Gandhi - has spotted a gap in the market for 'home-grown', affordable and stylish furniture. Today, and three weeks after opening, I went to visit Magnolia which is located just off Dr E Moses Road in Worli. The airy display space, divided up with floaty drapes - actually has room-sets - which is something you don't often see in Mumbai. And unlike some of the big colonial furnishing stores around the city, there is a distinctly young and 'unstuffy' vibe to the place. What is even better, Magnolia is pitched at a more affordable level than the prodigious Goodearth. There are several large made-up beds on show, quirky seating areas (such as the coffee table made from half of an old barrel with a piece of glass on top together with two stools covered with jute), and a few six seater dining sets. There are also desks made from old sewing machine tables, men's valet stands (for hanging trousers and jackets on), sideboards, bedside tables and so on. The stock is noticeably unhomogenised - each display and each piece of furniture being different from the last. Barrel coffee table with jute covered stools. Too cool for school. Some of the pieces are clearly up-cycled. So I like the fact that the Magnolia is also easy on the environment. Maulika tells me that all the furniture is made from solid wood, including recycled teak - which is also kinder on our forests. Vintage style fabrics are also used in seat coverings and on cushion covers - I even saw a set of nesting tables (which I think had been made from the wood of old railway sleepers) with Kantha hand stitched fabric under their glass tops. So unique! What are also unique (and I couldn't resist buying one of these) are the old brass cooking pots and lassi cups that have been re-fashioned using brass feet - one of these lassi cups is now my new pen pot! And that's not it for accessories - there are some beautiful Moroccan style table lamps which throw off sparkly lights, marble dishes, framed pictures (which would work very well in a colonial setting), Christmassy tea-light holders, wooden trays, satin bedspreads and cushion covers and some quirky industrial looking 'ornaments'. Nothing is over-embellished - some of it is contemporary, some of it classic, some of it slightly steam-punk - I reckon there is something for everyone here. Old brass cooking pots on feet - still can have many uses. Piled high with oranges or lemons? I could have waited until the New Year to post this blog, but as part of my Christmas Mumbai Shopping Guide, I think that the candle holders and the brass pots with feet are worth bagging in the last few days before the 25th of December. Again, be quick! I like this sophisticated bedroom set. A new Mumbai home furnishings store discovery! I can not believe that in the six months I have lived in Mumbai, I have missed this golden shopping gem! It was only when I went to visit the December Paramparik Karigar art exhibition with MaximumCityMadam - that I found it when she took me off on a flyby retail therapy tour that included CAC (!). Anyway, impressed by the store, I went back yesterday to pick up one or two extra decorations for our Christmas tree and to ask the store manager if it would be OK to take some photos and mention CAC on my blog. He happily obliged. I really do like this shop which is nicely laid out, spacious and airy. 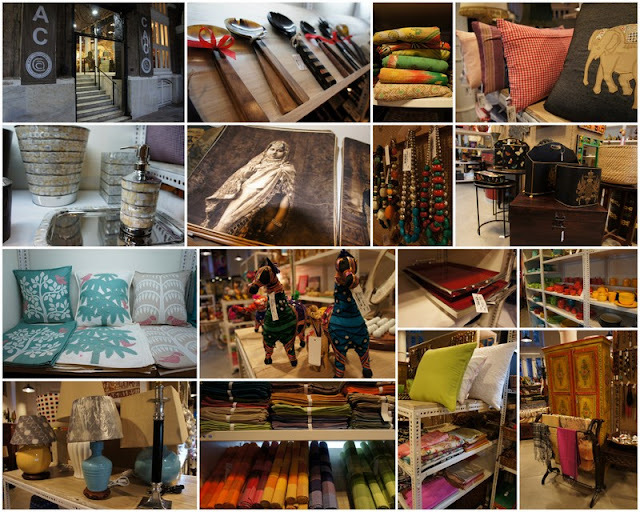 It retails a mixture of classic and contemporary Indian art and crafts (literally, per the name) but it also has a good selection of modern home accessories, suitable for anyone setting up a new home in town. The merchandiser has lovely taste - everything is nice quality and colourful with some slightly quirky items thrown in. The pieces of furniture include the odd armoire, towel stands, nesting tables, delightful carved mirrors and colourful painted benches and nightstands. The art is well curated. Currently, there are huge works of "Mata Ni Pachedi", (a form of Kalamkri art, but produced in Gujurat) as well as some pretty, smaller Gond paintings. On the accessories front, there is an extensive range of cushion covers - some with black and white images of Mughal royalty (Mr Jules, who later met me in the shop liked those), some with applique details in softer pastel shades, rectangular velvet covers with pearl embroidery, and even some red and white American Shaker style cushions. There are also quilted bed covers for about 4,500 Rs (the sort that you pay the earth for in Good Earth), as well as hand-embroidered throws from Kutch. My obsession....hand stitched Kutch style throws. There are accessories for every room in the house here - for the dining room, I found gorgeous bone serving spoons and forks, a myriad of table mats and napkins, funky lacquered and metal trays (from 2,250 Rs), loads of different wooden trays (some painted) and a good selection of candle holders. The crockery is colourful and hard wearing, perfect for the Indian home. For the bathroom, there are some classic soap dispensers, trays and soap dishes in stainless steel and mother of pearl. One thing I do find hard to find in Mumbai are decent table lamps at affordable prices. I found a good selection in CAC and may have to go back to buy one at a later date. In fact all the prices at CAC are reasonable by western standards. CAC is also full of great gift options - I wish I'd found this place in time for my Mumbai Christmas Shopping Guide! Ideas include jewellery made out of metal and semi-precious gems (though not particularly unique), silk bags and pashminas, adorable Panchatrantra stationery, the aforementioned cushion covers, photo frames and tissue box covers in mother-of-pearl and small hand-drawn pieces of art. I also really liked the large handmade dolls for little girls (currently reduced from 650 to 450 Rs). If you have chance to go this week, CAC have erected a beautiful Christmas tree in the store which is worth a look at and there are still some unique Christmas tree decorations to be had at 20-30% off. Be quick! There are also branches in Pune and Hyderabad, check the website above for addresses. The Mumbai store is around the corner from my favourite stationery store, Chimanlals.